The day-to-day benefits of cloud-based service automation are well-documented. But what can be harder to ascertain is the quantitative benefits, the money saved, and the impact on the company’s bottom line. 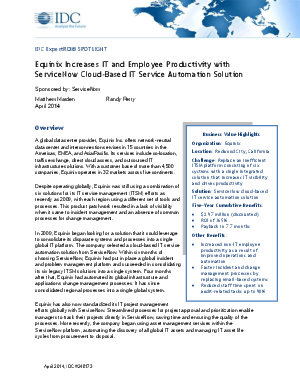 IDC and Equinix teamed up to crystallize the benefits of true economic benefits of ServiceNow’s IT service automation.